PAOLI, Pa. (April 4, 2019) — ATTENTION DODGE CHALLENGER AND FORD MUSTANG OWNERS: this is your chance to win a $5000 shopping spree on AmericanMuscle (AM)! 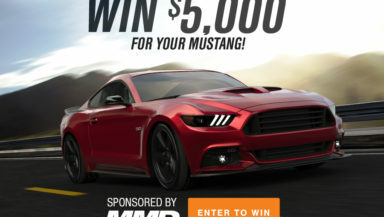 The MMD $5000 Giveaway is sponsored by none other than Modern Muscle Design (MMD), an industry leading automotive exterior styling brand combining iconic muscle design with next-generation manufacturing processes to ensure the highest quality standards. Potential participants can enter daily to maximize their chances in winning a site-wide shopping spree on AmericanMuscle.com. Even though MMD is traditionally known for automotive exterior styling upgrades, prizes are not limited solely to MMD branded products as the finalist can choose from anything on AM’s site including popular categories like: Mustang Exhaust, and Mustang Wheels to Challenger Lighting and Challenger Exterior. Participants should visit and complete the sweepstakes entry form daily until 11:59PM Eastern Time on June 30th, 2019—no purchase necessary. One winner will be selected via random drawing on or around July 7th, 2019. Starting out in 2003, AmericanMuscle quickly rose to be one of the leading aftermarket Mustang parts providers in the business. With the addition of Challenger in 2018, AmericanMuscle provides the most sought-after products, Mustang technical information, and fast shipping. Located just outside of Philadelphia, AmericanMuscle is dedicated to offering the Mustang and Challenger communities with the highest level of customer service. Please visit http://www.AmericanMuscle.com for more information.